Oriental Fruit Moth: First generation timings are updated below: According to the model, treatments should be over for the first generation flight statewide. However trap counts at several sites still show captures above the treatment threshold of 6/trap. Pest pressure is quite high on some farms in northern counties. Tufted Apple Budmoth (TABM): A biofix for tufted apple budmoth adults was set on 5/12 in southern counties, and May 14 in northern counties. 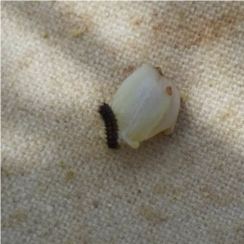 The first insecticides that target this pest will be due in a few weeks in southern counties. This has been only a minor pest during the last 6-8 years. Plum Curculio (PC): PC adults usually begin egg laying once the fruit is out of the shuck. Preferred materials that offer PC control now are Avaunt, and Imidan. If using high rates of a neonicotinoid (i.e. Actara, Belay, Assail), be aware that there is a synergistic effect when used in tank mixes with DMI materials (i.e. Rally) with regard to bee toxicity. Neonicotinoids should not be used if there are any flowering weeds in your orchard. Those flowering weeds will attract bees, which will be killed by the insecticide. The use of most of these products when bees are present is off label and therefore not legal. If pyrethroids are being used, then high rates are advisable, since low rates often do not control PC, especially in hot weather. Where PC is a problem, growers should rotate away from pyrethroid insecticides if possible. Actara and Belay will also control PC (and GPA), but not OFM. PC activity is ongoing but should be begin to taper off soon in southern counties. Maintain coverage with highly effective materials. See recommendations for GPA below. Green Peach Aphids (GPA): Green Peach Aphid: GPA colonies typically begin forming at bloom, however in southern and northern counties, aphids have yet to be seen in any significant numbers. If aphids are at the treatment level of 2 -5 colonies per tree, and your ground cover is clean of blooming weeds, a good choice that will cover catfacing insects, aphids, and plum curculio is Thiamethoxam (Actara and in VoliamFlexi). Actara will not control OFM. Examine trees for the presence of colonies by standing back and looking at the entire tree. Clusters of curled leaves will define a single colony. We use a treatment level of only 1 colony/tree for nectarine. If treating aphids alone then Movento @ 6 oz/A is a good non-neonicotinoid choice. Movento must be combined with a spreader/penetrant spray adjuvant. Used later during late May to early June this will also control scale. Movento will not control PC or catfacing insects. Lannate can also be used, but is not quite as effective and is a weak PC material. Tarnished Plant Bugs and Other Catfacing Insects: This is the other key insect complex at this time of year. Tarnished plant bugs will become more of an issue as temperatures warm and mowing and other ground cover activities become more common. General spray timing at this time of year should still be targeted for Plum Curculio (PC). Several materials, except some diamides (Altacor products unless mixed with a plant bug effective material) used for PC (and OFM) will have some efficacy for plant bugs. Bacterial Spot: Copper formulations should be used to suppress bacterial spot. Generally we recommend starting at 0.5 ozs metallic copper and gradually lowering the rate as the season progresses. The rate applied will depend on the formulation. Dr. Lalancette published a chart listing common copper formulations and rates for peach and nectarine applications. Also see the Plant & Pest Advisory May 10 edition. Avoid combining copper with captan especially if it has been overcast for several days. Also avoid acidic spray solutions when applying copper. Dr. Lalancette has published a handy guide for copper applications in early covers. Peach Scab: In addition to Rusty Spot and Bacterial Spot, peach scab requires protective applications at this time. Topsin, Topsin/Captan combinations, Gem, Inspire Super, and especially Quadris Top applied at petal fall are the best materials for blocks that had scab last year. Both Gem and Topsin should be used at the high rate to deactivate overwintering lesions on the wood. Quadris Top contains azoxystrobin which is phytotoxic to many apple varieties. Phytotoxic residues can remain in the tank for long periods after an application is made, even if a tank cleaner is used. Do Not use Quadris Top or Abound in the same sprayer used for apples. Rusty Spot: An effective material should be included at petal fall, and continue through 2nd cover on rusty spot sensitive varieties. Rally at 2.5 – 5 oz./acre is the standard and most effective product. Other effective materials include Gem, Inspire Super, and Quadris Top. 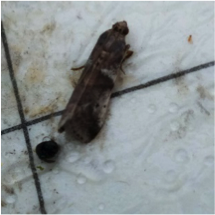 Codling Moth (CM): The first codling moth flight is well underway. Biofix dates for CM were set on May 5th in southern counties (Upper Deerfield) and May 9 in Northern Counties (Pittstown). Applications are due this week in southern counties and by 5/27 in northern counties. Spotted Tentiform Leafminer (STLM): Adults are flying, but are not considered a pest target at this time. This is one of the most highly parasitized insects in the orchard. We have not seen a real problem with this insect in recent years. Monitor your orchard for damage. European Apple Sawfly (EAS): This insect is active through bloom and into petal fall and first cover. Adult females lay eggs just under the skin of freshly set fruit, and the young larvae mine just under the skin. Where this insect is active, it is a primary target at petal fall. In orchards of mixed variety plantings, the petal fall spray for the entire planting is prolonged. This enables EAS to start damaging the first varieties where petals fell earlier before a petal fall spray could be applied to the entire block. Damage that is now seen in the orchard cannot be dealt with at this time. Several locations in northern counties have spotty areas of damaged fruit. Diseases: Apple Scab, Powdery Mildew, Cedar Apple Rust, are diseases of concern at this time. The NEWA scab models are predicting about 100% ascospore maturity in southern counties and close to 95% maturity in northern counties. Primary apple scab spores are released during any substantial wetting and infection period. Cedar apple rust infections can occur anytime between pink and 3rd cover. Scab lesions are present on several farms, particularly in northern counties. Any orchard that is clean from scab in southern counties now only has to be concerned with secondary infection. Disease management for Phomopsis and Anthracnose remain the main focus driving pest control programs. However in southern counties growth is progressing rapidly so that management for black rot and powdery mildew should be considered. As we approach the pre-bloom period (6-10” growth) downy mildew will also need to be managed. Consult the Commercial Grape Pest Management Recommendations for New Jersey for recommended materials and rates. In addition, Bryan Hed at Penn State has a rundown of new products available for disease management. Plum Curculio (PC): During this past week our numbers have increased slightly for PC captures and the number seen per bush. Our average count was 0.021 per bush, with a high of 0.6 adults per bush during the week of May 6-12, and averaged .063/bush with a high of 1/bush during the week of May 13-19. Trap counts are higher than bush/beating tray counts, and additional PC have been seen this week. The trap count maximum was 4 per trap in Atlantic County and 1 per trap in Burlington County. This all points to the fact that PC is the major pest of concern after bees are removed. While numbers were very low during bloom, the warmer weather has helped stimulate higher numbers coming into fields. If you are making decisions for treatment timings, Do Not Wait. Our overall recommendation is to treat sooner than later, unless PC is just not active on your farm. Gypsy Moth (GM): Early instar GM larvae averaged 0.021 per bush, with a high of 0.7 larvae per bush. During the week of May 6-12 and 0 to .05 larvae per bush during week of May 13-19 (Atlantic County). GM average .05 per bush in Burlington County. First instar larvae are very small (see figure 1), and first to second instar larvae are the stages most easily controlled by Bt products. At the present time most GM larvae are in the 2nd instar stage and going into the 3rd instar stage. No sites require control for this insect at this time. Other Leps: These include spanworm and a few green fruitworm larvae, and averaged .025 larvae per bush. These numbers are very low. Therefore when combined with gypsy moth activity, leafrollers and gypsy moth are not an issue. The primary insect target for the first post pollination treatment remains Plum Curculio. Cranberry Fruitworm (CBFW): CBFW traps were set during the week of 5/6-12. Adults (Figure 2) were found at low numbers during the week of 5/13-19. Adult activity in Burlington County is slightly higher than in Atlantic County. Cranberry fruit worm treatments are generally done in the second post pollination treatment during the first week of June. We are looking for a peak in adult activity, and therefore egg laying during the next week. 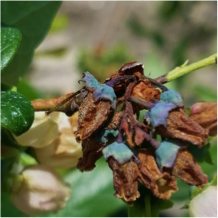 Botrytis Blight: During the past week during late bloom, several sites were seen with Botrytis symptoms (Figure 3) on flower parts. This averaged .078% clusters per bush with a high of 2% of involved clusters. If you have Botrytis, make sure to rotate fungicide types, and use materials that are effective for both Anthracnose and Botrytis control. These include Switch, Omega, Captevate, and to a lesser degree, Pristine, Abound and Captan. Blueberry: Summery of insect counts seen through May 19.